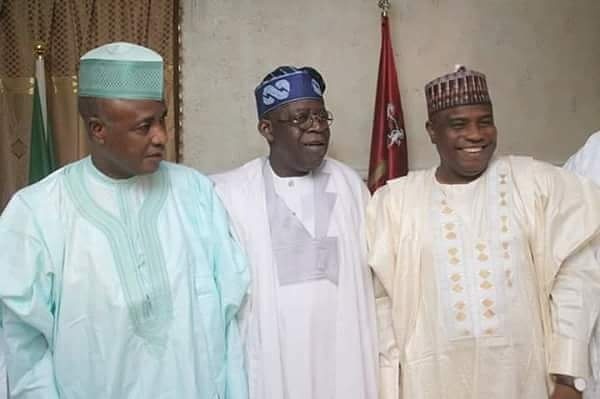 National Leader and head of the Presidential Reconcilition Committee of the ruling All Progressives Congress (APC), Asiwaju Bola Tinubu visited Sokoto Today Saturday where he met with Governor Aminu Waziri Tambuwal and his predecessor, Senator Aliyu Magatakarda Wamakko. Tinubu, accompanied by APC chieftain Alhaji Idi Farouk, held a 2 hours closed door meeting with his hosts at both the Government House and at Senator Wamakko's residence in Gawun Nama Area of the state capital. The meeting was later expanded to include Deputy Governor Ahmed Aliyu and National Vice Chairman of APC (North West), Malam Inuwa Abdulkadir. Speaking briefly to reporters after the meeting, Tinubu said he was in Sokoto for a family meeting. "Family members meet regularly to talk to each other and I'm here for that purpose," he stated.